Mid November list of horns for sale. + too many pics…. 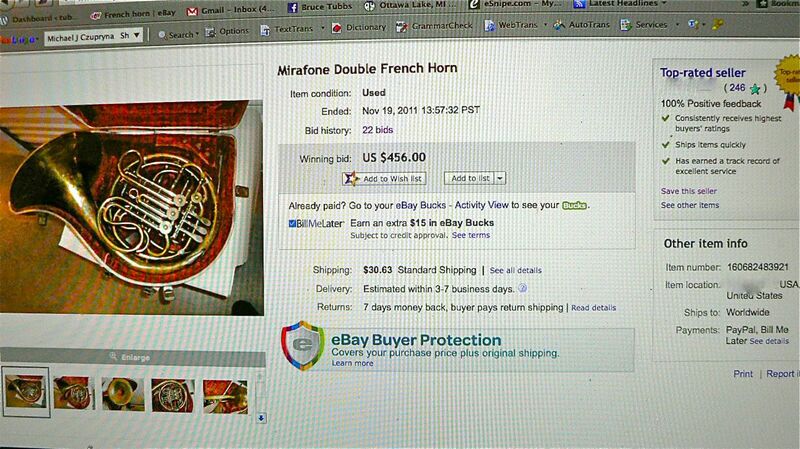 So you bought yourself a french horn. A series of entries (About 23 or 24 entries) to give you a sense of what it’s like to “work a horn up”. If you want to move to the next blog, click on the right arrow. There will be other blogs not dealing with this hor, but you can just skip by them….I was into altering color in the pics at this time. It’s so much fun when you find out something new, as an old guy, and you can go nuts with it for a time….The last blog in this series is entitled…”enough already” or something like that. So, you bought yourself a French horn! Hi – My dad is an avid horn player and extremely interested in your King Eroica horn, or any other silver/nickel Eroica horns you might have. However, he lacks social media, so he’s having difficulties contacting you. If possible, he would love to talk with you through email at tbarnyard@hotmail.com. Thank you!